Many parents are faced with the fact that soft toys their children have multiplied over time, as mushrooms after a rain. Bears and dogs of different sizes often bring a gift to friends and relatives. When it comes to parting with a stuffed inventory, to do some good things-pity, and find them new owners is difficult. Contrary to popular belief, children's homes and other state orphanages, as well as kindergartens, are not entitled to take from the population of soft toys. And generally only take new items, in packaging and with labels. The fact that handle these toys is not possible, but there is always the risk of “bestow” the orphanage household pests, taking them. 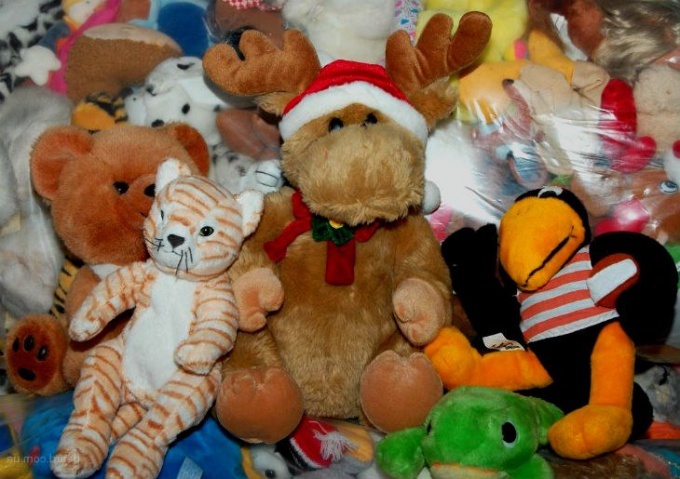 In some district administrations and the departments of social protection can take soft toys in good condition to transfer their children from low-income families. For the same purpose the toy can be attributed to the Church or red cross office. Don't forget to ask friends. Perhaps on a giant Teddy bear your child, or the Behemoth in the shape of a chair dreaming of their children or are children of their friends. Part of the toy can pick up collectors of a certain species of animals. By the way, cute velvet Bunny or the hedgehog will be happy lonely grandmother from the neighbors. Who does them little gifts, and to decorate the humble life is also desirable, even if there are no children and grandchildren. Check where your city has an online platform for an exchange of goods or transfer them to anyone for nothing. Often I wish to obtain new toys live nearby, but not familiar with those who gave them. Quality and unusual soft toys can be taken to thrift store. Then they even manage to raise a little money. Of course, the amount is not large, because the store still make their margin and the final cost must stay low for a buyer of used things. The easiest option-to make toys in their own yard and offer the neighborhood kids. Or just leave them next to the container platform. Just make sure that they expected the new owners in good weather. If snow or rain will spoil them, toys can be simply thrown away. Only to give you somewhere soft toys need washed or cleaned, with intact seams and a full set of paws, noses, ears and eyes.